New York, NY (May 23, 2011)�Eagle Rock Entertainment is proud to announce the simultaneous June 7 DVD and Blu-Ray release, through its wholly-owned Eagle Vision subsidiary, of Miles From Memphis Live at the Pantages Theatre by Sheryl Crow. Featuring 18-songs in high definition, DTS 5.1 Surround Sound, the 2-hour+ release captures a standout show at this pristine art deco Hollywood venue. [MSRP $14.98 for DVD, $19.98 for Blu-ray]. Filmed in the Fall of 2010, the show captures the talented singer/songwriter�touring in support of her 100 Miles From Memphis album�fronting a powerhouse 9 piece band that swings through the best tracks from the record, and reinvigorates fan favorites with a soulful Memphis flavor. And there's a little Motown in the mix too, with Crow's 1994 megahit "All I Wanna Do" extended with a jam on Marvin Gaye's classic "Got To Give It Up", and a joyous rendition of the Jackson 5's "I Want You Back". Opened in 1930, the Pantages Theatre is an art-deco masterpiece. Howard Hughes once owned the venue, which hosted the Academy Awards from 1949-1959. This glamourous Hollywood treasure provides a stunning backdrop for Crow and her band, The Thieves. "It was a very special night, playing with this incredible band in this wonderful venue, and I'm so happy to be able to share it with all my fans around the world," said Sheryl Crow. 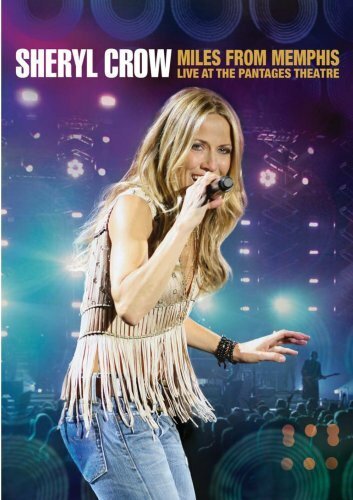 Bonus features include a special behind-the-scenes bonus feature of Sheryl and her band, and a soundcheck of two songs�"Eye To Eye" and "Stop" which were not in the main show. Sheryl Crow has sold in excess of 35 million albums worldwide.